Erin Allday of the San Francisco Chronicle filed an article this weekend reporting a Stanford University research project suggesting autistic children have a distinctive topography within their brains, based on data obtained from brain scans of 24 autistic children between ages 8 and 18 when compared to scans of 24 non-autistic children. Unlike previous studies that analyzed the overall volume of the brain, where it was found that autistic children generally have larger than average brains, but the information wasn’t refined enough to be useful in diagnosing or treating the disorder, the Stanford study sectioned brain scans into tiny cubes and compared the size and structure through computer analysis. What they found was a pattern of organization in regions of the brain affecting communication and self-awareness particular to autistic children (communication and awareness are hallmark facets that autism affects). The brain maps applied to 80 to 90 percent of autistic children, and the research pinpoints a potential bio-marker should the maps be replicated in a larger group of children. While the research is years away from application in the real world, coupled with questions about the method’s validity in screening children, the goal is providing refined treatments and clearer understanding of autism’s impact on a vital organ. The research was published online in the journal Biological Psychiatry. Numerous studies and endless research attempts to find a biological indicator for autism spectrum disorder will continue as long as the cause of the condition remains unknown. On this blog, I’ve covered urine tests and studies on genetic proteins as potential signs to determine whether or not a person fits the autism spectrum. The explorations of so many subjects aren’t all that different from “old wife’s tales” of treating various conditions. When there’s a lack of concrete indicators for a disorder or disease, researchers task themselves to discovering at least one answer. Throughout the quest, numerous possibilities and theories emerge until further research either eliminates them or creates new support to continue investigating a certain topic. Unfortunately, the process is agonizingly long and often ignored by a mainstream audience thirsting for instant gratification, and that’s one reason why stories I cover on biological research often mentions such studies are years away from widespread relevance. Another reason? Small sample sizes. In order to determine whether a theory is potentially correct or not while avoiding over-exerting resources, autism studies will generally use a localized test group that rarely breaks four figures. This story is one example of how quickly patterns and similarities can be found among people with a particular condition, and that itself is progress compared to scientific observations of autism 20 years ago. Allday goes through the usual angles in covering this story, explaining autism’s rapid growth while a solution to finding the cause continues. I’ve mentioned before that stories on studies are difficult to provide detailed information because what is published is usually an early step of testing a hypothesis. Allday tempers any reader who may spout that a bio-sign was found by uncovering the unknown usefulness of the research itself. Stories like hers will continue to be published to newspapers as a “mainstream translation” of what is disseminated by journals, even though answers lie far beyond. However, when a biological cause is found, reporters will hopefully have at least one story of their own to reference. 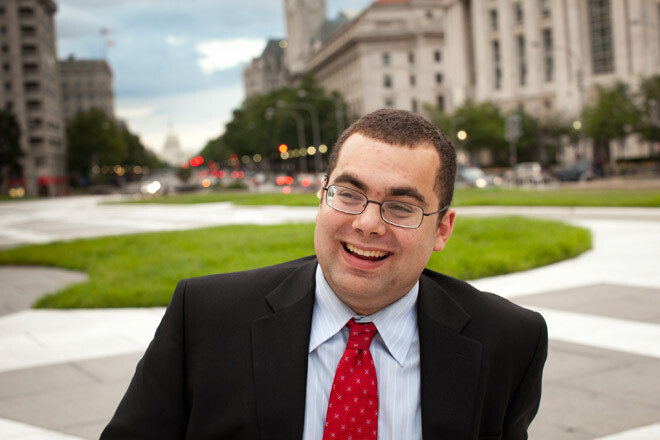 Two things became clear to me as I read a Q&A by Steve Silberman, a contributing editor for Wired magazine, with Ari Ne’eman, now the first openly autistic White House appointee in the country’s history. First, my blog is drawing more eyeballs than I thought. A friend of mine, who runs the blog site swirlspice.com, linked me to a MinnPost story via Twitter. MinnPost, in turn, linked the original story on the Wired website. I’m aware people do visit my site, since I can track how many visits are made in a window of time, but people I’m connected with are now just starting to send me links to news stories involving autism. Second, Ne’eman and I appear to notice the same patterns in the treatment of autism in society, even though we’ve never met and likely lack parallels in our examinations of the disability. That doesn’t qualify one of us over the other, our paths merely lie in different directions. The last time I talked about Ne’eman, he was still awaiting a Senate holdout blocking his confirmation. The hold, which can be placed anonymously, was later dropped, but not before controversy swelled within the autism community as divisions still exist on adapting versus curing autism spectrum disorder. Specifically, Ne’eman’s drawn flak because of his functionality, with critics suggesting he’d overlook the plights of more severe autistic people. Ne’man’s philosophy also ignited flames, with his belief that more resources should be devoted to helping autistic people adapt instead of finding a cause or cure to prevent the condition in future generations. I won’t discuss much about the Q&A itself, since the only true intervention from the reporter is what questions were included in the story and how many quotes were included. However, Q&A sessions are no less credible than crafted stories in magazines and newspapers. A Q&A gives the audience an unfiltered discussion, where the reporter and viewer become listeners. Wondering about what patterns him and I noticed? Ne’eman was asked about autism’s cultural shift from invisibility to media darling in the 21st century, and his response was that a special skill or astonishing success story was needed to gain representation in media (he discusses the other category of autism stories in other questions, where the picture is far more grim). His recommendation? Learning about autism doesn’t have to come from himself, Temple Grandin, or John Elder Robison (author of Look Me in the Eye), since so many exist in educational and workplace settings. While I cannot measure individual experiences with autism outside of my own, reading the Q&A does highlight autism’s complexity and summarizes what may be a future focal point for journalists covering autism. Before Saiqa Akhter dominated autism headlines this week, science produced news that could assist developing an objective form to detect autism, marking the second time this year I’ve come across an article that discovers new possibilities. The first brought forth the theory of using urine tests to diagnose autism. This time, scientists say they’ve designed a computer program that can distinguish speech patterns between autistic and normal children, correctly identifying more than 85% of its subjects. Scientists working on the study discovered that autistic children mangled their syllables for much longer than non-autistic children, making a diagnosis easy for the computer program. However, those involved in the study recommend caution: the lead researcher doesn’t believe the program should be the sole measurement in determining who is autistic. The article may be another sign of an incoming phase in autism coverage. A CNN article a few years back highlighted the primary problem of no objective method of diagnosing autism. A couple years back, ABC News reported a study that found certain genes in an autistic person’s DNA lie dormant. With two discoveries this year, it’s clear there’s a focus at finding something that will make autism diagnoses foolproof (there’s some skepticism at the rapid increase in autism diagnosis rates). While the Internet posts its share of contemporary issues, the medium is also proving its use at publishing articles paving new paths for the autism community, and it goes well beyond Google searches. Home pages of various e-mail and Internet service providers have a page that features major news stories at the moment, much like the front page of local and national newspapers did before the delivery of news rapidly increased speed. Because these sites update their top stories every few hours, topics ignored by other outlets have a place to carry their information. It would be a safe bet to suggest more objective methods of looking for autism in children will appear, although how coverage will branch after that is unknown. Reporters may choose to focus on how soon objective tests will be put in place, others may weigh pros and cons against the status quo, and there may be a chance of hearing stories about psychologists’ appointments dropping because their services will no longer be required to provide an autism diagnosis. Of course, they will still be needed to help manage autistic people’s behaviors. In any case, expect computers to be at the forefront in finding an indisputable form of detection. At least according to a new study that was published in the June 10 issue of Nature. U.S. News & World Report also reported the findings, which could serve as the next step in finding an indisputable cause for autism. The study pinpoints genetic abnormalities in people with autism spectrum disorder versus people who aren’t autistic. DNA segments are either missing in autistic people or carry a segment repeated several times, known as copy number variations (CNV). On average, autistic people had 19% more CNVs that unaffected individuals in the study, and most CNVs in autistic people were inherited from their parents. Scientists involved in the study say the findings confirm a hypothesis that autism has hundreds of genetic risk factors. However, they say knowledge of genetic abnormalities will also improve treatments for the disability. Obviously, one study can’t and won’t answer every question out there. However, applying this new information may ultimately have an effect on contemporary topics involving the autism community. A genetic risk for autism would counter the idea that vaccines are the culprit since DNA is constructed long before a child is born. Suggesting genetic factors could also lead to genetic testing for the condition. Controversial as they may be, considering the concerns people have about insurers or employers getting a hold of that information, I doubt autism would ever go that far. If further research supports the findings of this study that autism may be passed genetically to kids, even if parents are nowhere near the spectrum (and virtually none are), it may affect decisions about raising kids. I’ve lost count as to how many times I hear parents metaphorically equate an autism diagnosis with a cancer diagnosis when they find out for the first time. While finding a specific percentage of parents who succumb to fears is virtually impossible, in theory, there’s a possibility if they can get an answer in advance.